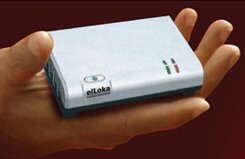 elLoka Techsolutions Pvt Ltd a Hyderabad based product design and manufacturing company that delivers Ultra Low Cost Computer Platforms(ULCCP), has come up with a palm-sized computer that is very cheap and consumes very little power. The computer is on display at the Rambagh SMS Convention center in Jaipur, Rajasthan where a three-day Commonwealth and information technology meet is on. Targeted at home users, and people in Indian villages who are plagued by intermittent power failures, this computer can effectively run on Solar power and is eco-friendly. The company claims this computer known by its acronym GreCo which stands for "Green Computer" consumes only 5W power and it weighs a mere 135 gms. It is being marketed in India for a price of Rs 5000 (approx USD 100). 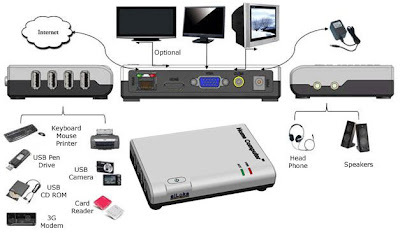 At this price point, it comes with a power adapter and AV cable which you can connect to an LCD screen or to your TV. Optionally, at additional cost, you also get a keyboard and mouse. It runs on a customized OS named HomeOS which the company claims is built on top of a Linux base. Some what similar to Google Android which also runs on a Linux kernel. The OS comes pre-loaded with numerous open source software which caters to the typical home users need. OpenOffice.org is installed, so is GIMP, MPlayer for listening to music and watching movies, Firefox, Flash player - so you can watch YouTube videos, Email client, Pidgin Chat client, Image viewers and more. Watch the following video that showcases the power of this palm sized computer.